A few years ago, I was given the opportunity to review a set of Valslides through my partnership with FitFluential. It was honestly love at first try...and I still love them, except now they come in pink and mine are the old green color. (It's the little things.) Really, though. Such a great piece of equipment, and one that I often pull out when I work out at home...I'm guessing I'll be using them a lot in the upcoming months as I get back in shape post-baby. Because who knows how easy it'll be for me to get into the gym. That all remains to be seen. As always, consult with your physician before trying anything new. You know why. And it goes without saying that all times/repetitions are a guide. Please adjust as you see fit. Place your right foot on the Valslide. Lunge back as deeply as you can, return to the start and immediately lunge out to the side—but keep your bodyweight on your left leg. Do as many repetitions as possible in (:30). Repeat with your left food on the Valslide. Lie flat on your back with each heel on a Valslide and arms at your side for support. As you contract your core/glutes, curl the heels underneath you to reach hip-press position, then return to start and repeat. Do 15 hamstring curls. (Note: Heels should never come in further than your knees, which means you should aim for a 90-degree knee bend. Perform a standard mountain climber with a Valslide under each foot. 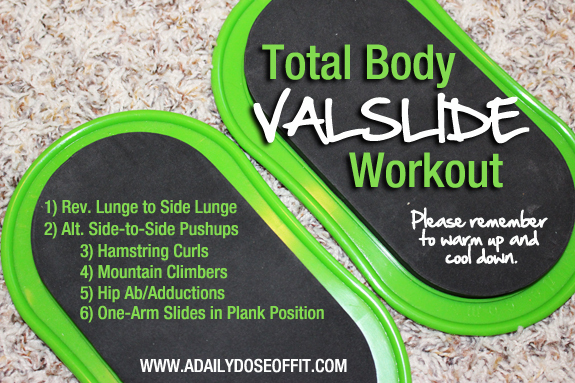 Your feet should remain in contact with the Valslide, and consequently the floor, at all times. Push for increased speed as you see fit. Do 30 repetitions total (15 per leg). Place a knee on each Valside, maintaining an upright posture with arms at your sides. Slide your knees out to the side, then pull them back into your starting position. This does not have to be a big movement! Beware of over-stretching yourself! Also, it should be slow and steady for the best possible burn. Do 15 repetitions. Any questions? tara (at) adailydoseoffit (dot) com. Question: What's your favorite piece of at-home equipment? I have always wanted to own a BOSU...the pink one! It's one of my favorites, too. I use it almost every time I hit the gym. Yes, pink! I think it's a special Breast Cancer Awareness edition, which makes it even more awesome.